It’s Cara here from Leo Listening , where I help advanced English learners fall back in love with their favourite films and series by teaching them how to break free from the subtitles. 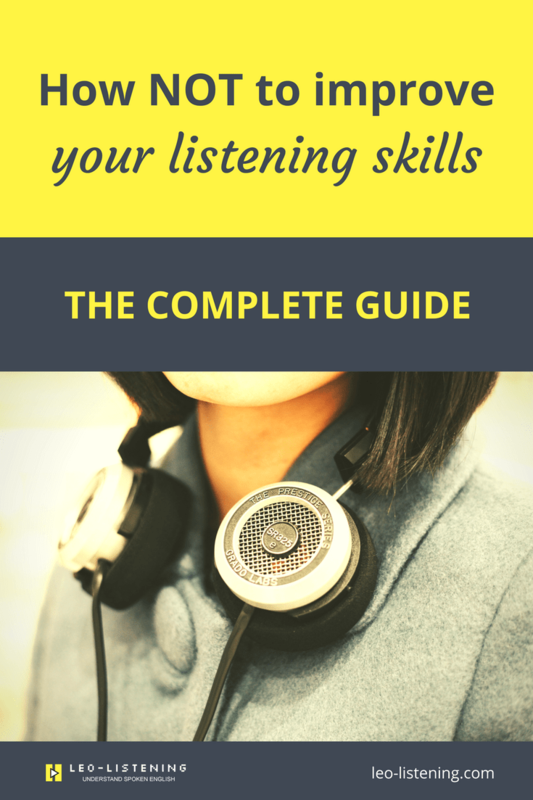 So, I’m going to go back to basics about certain points to do with listening in this post, which is all about how not to improve your listening skills. The thing with listening in English and other languages is a lot of the advice is a bit crap! A lot of us don’t know what we’re doing wrong. Most teachers, including me before I took an interest in this stuff, don’t teach it, we just test it. So nobody really knows what they’re doing. For this it’s really important for me to go over the problems and what’s wrong, and to help you rectify them. So that’s what today is all about. It might be a bit long. Remember there is also a video as well if that’s easier for you to go through it that way. Otherwise stick around and I’ll take you through how not to improve your listening skills. The first thing to do to not improve is to just listen. If you don’t want to get any better, then just listen. Listen with no purpose or no goal or strategy. I’m being a bit unfair because obviously just listening and powering through, eventually you will probably see some improvement, but it’ll take ages! Did I not understand because there is a new word? Was something else going on? You know, in films and series it could be cultural references or something like this. So this is why, and if there’s one thing that you do, if possible, please make sure that when you listen to something, you also have something written that you can then use to check it. It’s a way to see what you heard, and then check and find out where you went wrong. This is why doing activities like dictations or shadow readings really work. They force you to actually see where you made a mistake and how to fix it. So really the idea is that you need to do something with your listening and have something to check your work essentially – something written. The next way to not improve your listening skills is to spend all your time and all your energy getting obsessed with finding the magic bullet. A lot of people are going around the internet looking for the magic bullet for English. So the magic solution for being fluent or the magic solution for remembering words. The magic solution for understanding everything in English. Here the important thing to remember is that there is no one magical solution for mastering any area of English. There isn’t one. So just stop looking! There is no magic solution for fluency. There is no magic solution for remembering words. It doesn’t exist. So what you really need to focus on and what is a much better use of your time is mastering yourself and mastering your learning. So, getting into habits and routines with your listening, reflecting on your listening, trying new things out, getting feedback. This is how you improve, and that works for any area of English and basically any skill you’re trying to develop. The thing is, when people talk about listening skills in English, they talk about resources and things. They say “you should listen to this” Or “you should listen to TED talks” or “you should listen to this podcast”. But we don’t hear a lot about the techniques and activities that you should be doing to improve your listening. Again, it comes back to this idea: there is no magic resource. What you need to do about the resource question is sit down and ask yourself “what kind of English do I need? Do I need to understand conference calls? Do I need to understand presentations? Do I need to understand native speakers? The answer might be no or it might be yes. Then find material to solve that problem. If you need to understand presentations at work, that’s where TED talks are useful. If you need to understand other native speakers, if you’re living in the country and you want to improve that, don’t waste your time with the TED talks. Go and watch vlogs. Go and watch TV series. Go and listen to podcasts. That’s going to be more useful. The next step of course is doing the right kinds of activities. Decide based on what you need. Do not get obsessed with the magic bullet. The third thing that you’re probably doing to not improve your listening skills is hiding from the reality of fast spoken English. So I’ve said at the beginning, listening is something that’s very poorly taught. What happens is most teachers, and I include myself in this. I’m not blaming or shaming anybody. I used to do this too. Most teachers just test you. So you can remember in class at school or wherever you listened to something, you have a list of questions, you choose A B or C, and that’s it. That’s not teaching. That is testing. The things that you tend to learn are compensatory strategies. These aren’t strategies to improve your listening. They’re strategies to help you cope. Just guess from the context. Just use the visual clues. Now, these are useful strategies, but what needs to happen is you need to learn how to understand real, fast spoken English with all its difficulties. We’d all rather listen to slow audio, slow teachers on Youtube, easy audio for English learners! Of course we prefer that because it’s scary when you listen to fast native speech, but that’s what you need to do. And you need to understand how the words that you already know in writing sound in speech. You need to know about pronouncing things this way. You need to learn about connected speech. You need to do ear training exercises like dictations and gap fills. I’m going to give you some resources. But you have to know that you need to confront real, fast, spoken English. The other thing people are doing, or you’re doing, to not improve your listening skills, emphasis on not, is worrying about how many words you need, phrasal verbs, or slang. So the real problem in listening is the words you do know. The words you know in writing. All the little grammatical words that you already know. The thing is, in conversation for instance, we tend to use the same 1000 or 2000 words. In day to day conversation, we’re not using 10000 different words. Of course I understand if you haven’t lived in an English-speaking country, you probably don’t have all the informal, every-day expressions. But you can learn these if you listen to the right type of input. Earlier I mentioned podcasts, vlogs and things like that. Also not all phrasal verbs and not all informal expressions are important. We use some of them a lot more than others, so you want to concentrate on learning those words. Why are the words that you do know the problem? You can know a lot of words and still not understand. What happens is words change in fast speech. Essentially, speaking requires effort and we want to minimise our effort. This is why words join together. This is why sounds disappear. This is why sounds blend together. This is why we emphasise some words and not others. That’s essentially the idea of connected speech and that’s what you really need to be working on amongst other things. Another reason that you’re not improving your listening skills, or another way to not improve them, is to assume that speech and writing are kind of the same thing. They’re not. Let’s just clarify this. Spontaneous speech or conversational speech is really messy. For example if you read a transcript of a conversation, it’s kind of an incoherent mess. When you’re having a conversation with somebody, you haven’t planned in advance what you’re going to say. You just make it up as you go. This is why in conversation in any language, not just English, we pause, we hesitate, we use filler expressions like “you know”. The good thing is, we can filter these things out because they’re not important. You can also use them in your own speech to sound more natural, which is good news, isn’t it? We don’t speak in nice organised paragraphs. That can happen in a TED talk for instance, but that’s because it’s planned. Even movie and TV dialogues are a bit more organised. But conversation is a real mess. So don’t expect it to be nice and coherent like paragraphs. That’s not how we speak. 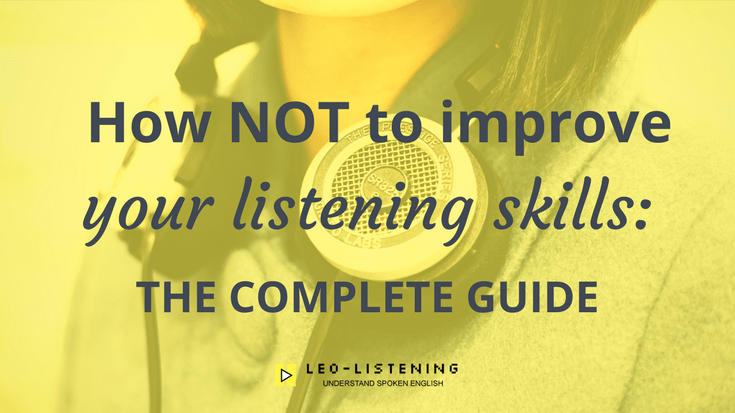 Ok, so we’ve been through how not to improve your listening skills. This was the complete guide. Now something practical for you. Here’s what you need to do next to improve your listening skills. I want you to decide on your goals for your listening and pick the right type of resource for your needs. I want you to commit to stop wasting your time trawling the internet and going through the pages of the internet, looking for the magic bullet listening resource – because there is none. So just stop! What you can do instead is focus more and learn more about listening techniques and exercises to train your ears and help you deal better with fast native speech. I’ve got a little product called the Leo Listening log, which gives you a structure and some activities that you can use. You can also use the fabulous Tube Quizard website, which is all about ear training, or Helen’s language Home which has some lovely exercises on connected speech. Make sure as well wherever possible that you’re using listening resources with some kind of text. That could be a podcast with a transcript. It could be a film or TV show with subtitles. That’s basically the two main ways to get a text. Make sure that you are reflecting on what you’re doing and keeping track of your progress. Even when you start doing the right things to better understand what you hear and to improve your listening skills, progress is still slow. So make sure that you track and reflect on what you’re doing and again the Leo Listening log will help you with that. Remember you’re doing great, you’re making progress, and it’s all good! Especially now that you know how not to improve your listening skills and what to do instead. So wherever you are, if you’re watching or reading this, all the resources will be under the video if you’re watching the video, or somewhere in the blog post. I’d love to hear your comments, any questions you may have, any commitments you’re going to make, what type of listening resources you’re going to focus on now that you know what you’re doing! Let me know – I love to hear from you! Really great post, Cara! It was great to see it all put together-the “big picture” of how to improve (or not to improve) your listening. Thanks Lori. This post has been a long time coming! Great job ! Thank you very much. I love the “magic bullet” idea and so many people are wasting their time and mony searching for it. It’s the same about losing weight products. Hi Olena. Good to hear from you again. Thanks for your kind words. Yes, we can see the “magic bullet” across many different industries. I think the only real magic bullet is our willingness to learn, experiment, grow, reflect and listen to our own intuition throughout the process.